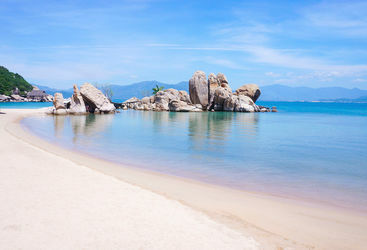 The Evason Ana Mandara is on a private stretch of white sand near the Tran Phu Boulevard in Nha Trang, the coastal capital of the Khanh Hoa province. This luxury beach resort consists of 74 elegant rooms and suites within 17 splendid villas, all with their own private terraces and with views over the tropical gardens that encircle the resort or over Nha Trang Bay itself. Dining is at the main Pavilion restaurant or the more relaxed pool bar. There is also a Six Senses spa in a coconut plantation offering a wide range of relaxing beauty treatments. For those who like to enjoy Tai Chi or Yoga as a holiday therapy, there are always lessons available. There's also a pool, table-football and a floodlit tennis court . If water-sports or diving appeal, the resort has a 5* watersports and PADI diving centre. The beautiful grounds require the love and attention of five full-time gardeners. Rosie is our 'Evason Ana Mandara' expert and as a seasoned traveller has the inside track on the most memorable adventures.